We’ve heard them all over the years, even more so since the arrival of Gérard Houllier. But the proof was in the pudding on Tuesday night at the Philips Stadion, it was like the script had been written in advance. OL emerged victorious 1-0 from a battle typified by the 50-odd free-kick blown by Mr Kyros Vassaras and the five yellow cards and one red card he dealt to the French champions. In the en dot was Lyon that won the aerial battle, despite the incredible Vennegoor. They overcame the exit of Cris and a reshuffle at the back, the red card to Govou... they had used up their quota of luck when Alex’s missile bounced off the crossbar, when Koné, alone in front of an empty goal could only find the post and when Vennegoor’s header flew just centimetres wide of Coupet’s goal. Without an exceptional save by Greg in the opening minutes to deny a VOH header, the game might not have turned out the same. His opposite number Gomes wasn’t having the same sort of night, especially against Juninho’s free-kick! Juni, once again, proved his worth in scoring his 60th OL goal, his 25th free-kick and his fourth in the current Champions League campaign. These two stars of OL have won so many matches between them. On a slippery playing surface in the magnificent Dutch ground, Clerc continued his adaptation to the highest level of club football. The man from Bress had another great game, both defensively and offensively. Wiltord’s introduction did wonders for the French side, such is his skill and instinct on a football pitch. Portugal midfielder Tiago covered the four corners of the pitch, harassing, challenging and distributing. 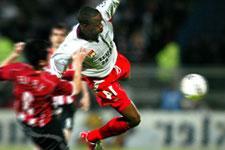 Diarra is a warrior. Abidal once again changed position during the match without a hiccup, and what a match he proceeded to have in the middle! Malouda moved back to left-back and was strong and controlled in his duels… OL is one well-oiled machine. Past European campaigns have brought experience, maturity and ambition, while OL’s opponents have learnt respect and even fear. Each year, the recruiting has added a little bit more, each new coach as well. Lyon won on Tuesday night, a match they certainly wouldn’t have won in the past. More proof of the club’s progress under the president, Jean-Michel Aulas. At the Stade Gerland, Les Lyonnais dominated PSV and ran out 4-0 winners. They are qualified for the quarter-finals of the Champions League… for the third time in a row. Lyon won 1-0 in the Netherlands. Take a look at Lyon's European figures for 2005-06. 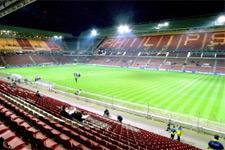 A winning return to Philips Stadion? OL resumed training on Wednesday afternoon and will be back in official competition against Strasbourg on January 4. What have OL’s future Champions League opponents, PSV Eindhoven, been up to during this time?